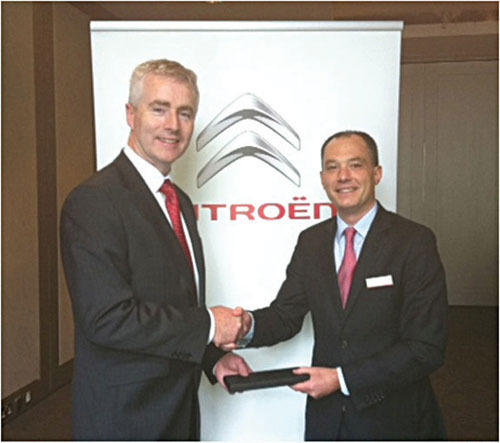 Pictured at the Citroën dealer conference recently were Brian Kenny, dealer principal of Kenny Galway accepting the Citroen European Dealer Award 2011 from Frederic Soulier, managing director of Citroën Motors Ireland. Kenny Galway has won national awards for excellence after securing top places in both the Citroen European Dealer Awards 2011 and the Volvo 2011 Irish Dealer of the Year. After beating off competition from dealerships all over Ireland, Kenny Galway took the top Citroën spot and will see dealer principal Brian Kenny travel to the European awards ceremony where he will be presented along with other top dealers from around the world with the prestigious award. The Citroën European Dealer Awards 2011 are presented for an outstanding performances in vehicle sales, parts sales, vehicle sales market share, and both sales and after-sales customer service, all of which were achieved through the experience and dedication of all the team at Kenny Galway. Kenny Galway was also announced as the Irish Volvo Dealer of the Year 2011 last month at a presentation event in Sweden. The Volvo Dealer of the Year award recognises the dealership that has consistently achieved the highest standards across a range of criteria, including sales, aftersales, training, customer service and brand representation. Brian Kenny, commenting on the awards said: "This is an incredible achievement for the Kenny Galway team and we are delighted to be recognised as the top dealership for both Citroën and Volvo in the country. This is great recognition for our excellent staff at the dealership.